MANILA, Philippines – Ohio Native and Comeback Kid Lebron James scored 30 points to notch Cavs’ second straight win in NBA Eastern Conference Round One Playoffs against the seventh seeded Boston Celtics, 99-91 at the Quicken Loans Arena in Cleveland Ohio, USA on Tuesday April 21 (Wednesday April 22, Manila Philippine Time). Lebron James surpasses Jerry West for the 7th spot in All Time NBA Playoffs scoring title. 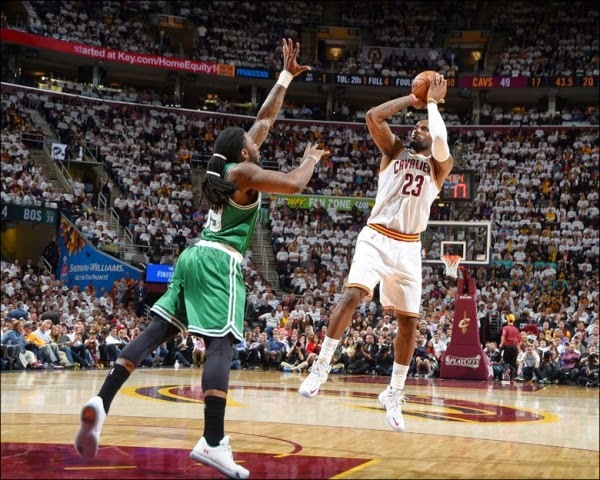 The Wine and Gold Team headed by 4-time NBA MVP Lebron James handed the Celtics their 2nd straight loss in their best-of-seven playoffs duel alongside with fellow top draft pick Kyrie Irving. Both squads started slow during the first 24 minutes of the ball game. With just 1-point, 51-50 lead by the home team, Lebron James just scored 11 points and Isiah Thomas Jr. had 9 for the Celtics. Come third period, the Cavaliers advanced as much as 14 points lead by the Big Three and their Russian Center Timofey Mozgov who had solid 16 points and 5 career high shot blocks. The Young Mozgov perfectly filling-in Cavs’ first-string Center, Anderson Varejao is out for the whole season due to a torn Achilles. Final quarter gave the home turf a scare when Boston Celtics Point Guard Isiah Thomas Jr. initiated the comeback with his inside and perimeter scoring and topped his own team with 22 points and seven assists. Cavs foul trouble became a huge factor for the Celtics to close the scoring gap in the fourth period. Timofey Mozgov was fouled out and Shooting Forward Kevin Love spent most of his last 12 minutes of the game on the bench after committing his fifth personal foul while Lebron James and Kyrie Irving both had three. Despite of their three personal fouls, James and Irving managed to spoil Thomas Jr. and the entire Celtics run for a possible upset victory over the second seeded team with 30 and 26 points respectively. With his 30 points, Lebron James made another milestone in his basketball career by surpassing one of NBA’s greats and legends Jerry West for the 7th spot in All Time NBA Playoffs Scoring Title. The Celtics will host the Cavaliers for game number 3 of their best-of-seven series at their home turf at TD Garden in Boston Massachusetts on Thursday, April 23 (Friday, April 24 Philippine Time).